When you descend the stairs into our basement, one of the first things you see is this antique sideboard that my parents gave me. 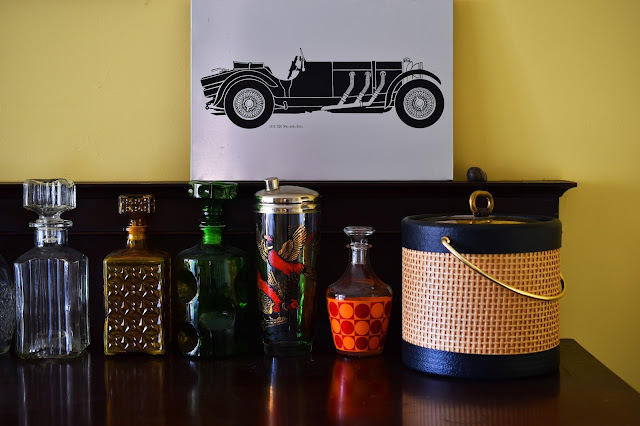 Like any flat surface in our home (including the floor), the sideboard tends to accumulate clutter. So job number one of our basement clean-up was clearing the sideboard off and making it look nicer. I have more dishes than I have storage space for dishes, so I decided to set out all of the vintage liquor bottles and barware that I have either thrifted or been given by my parents. 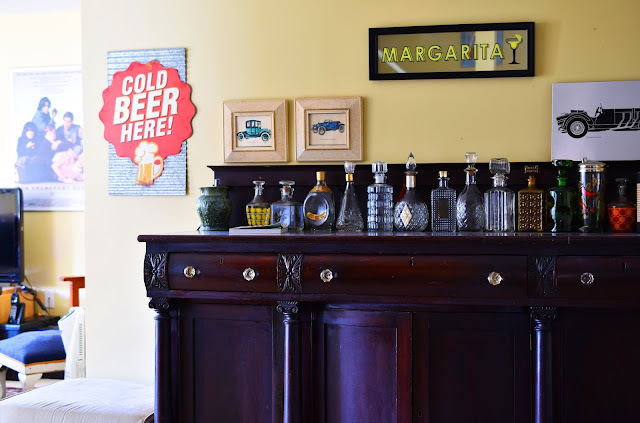 I suppose I thought of making this sideboard a bar area of sorts because that's what it always was in my home growing up. My dad had a sign above it that said "Pete's Private Bar" and my parents would serve drinks from it when they had friends over for parties. We put a few of my dad's vintage car pictures just above the "bar" as well. My dad really likes antique cars and I remember him often sketching cars like the Model T Ford when I was a kid. (Dad was born in 1927 so the Model T would have still been around.) 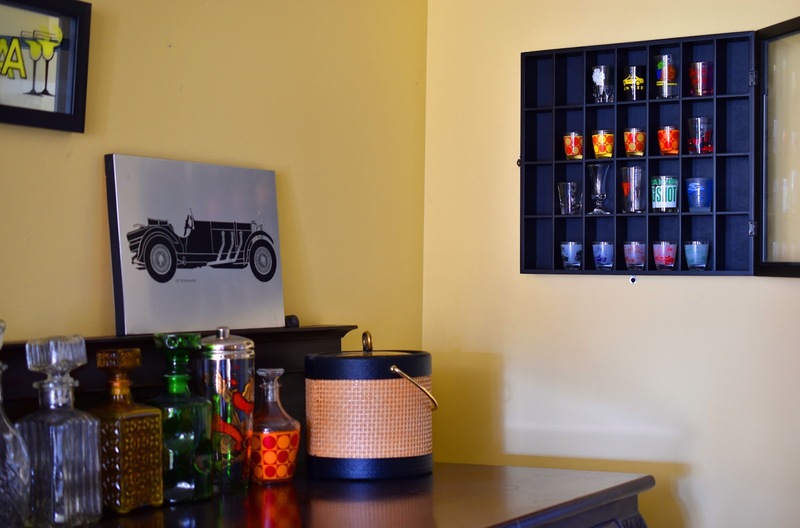 We also mounted a cabinet for our small collection of shot glasses on the wall to the right of the sideboard. We bought "Margarita" (me) and "Cold Beer Here" (hubby) signs from Homesense. The only thing we haven't put in the bar area yet is the liquor. With the kids heading into the teen years, that might have to be kept under lock and key soon! 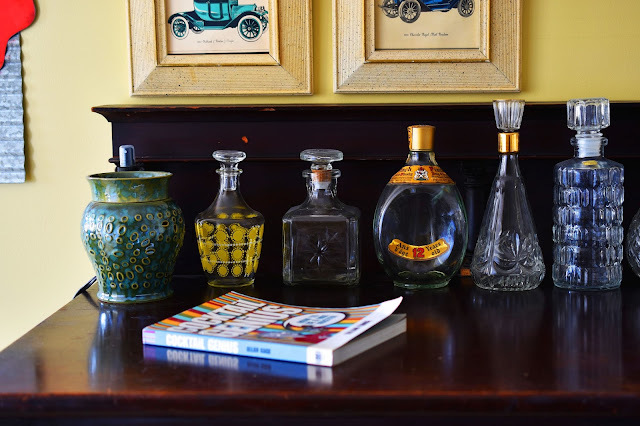 The challenge now is keeping the sideboard clear of excess stuff. And keeping all those glass bits dusted! What do you think of our new "bar" area? 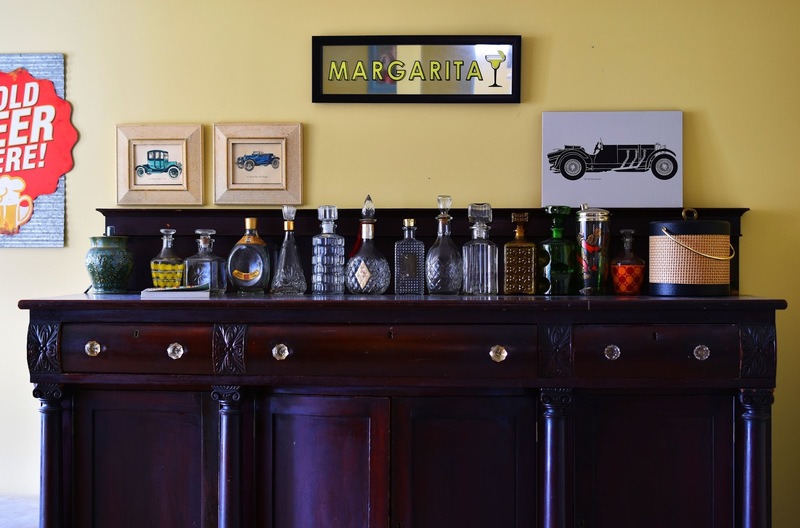 Do you have a bar in your house? I love the shot glasses on the sideboard. So cool!!! that was the first thing that caught my eye too!! Hi Joanne, thank you for sharing your Basement Bar. Lots of vintage. Thanks for visiting and linking up Joy! Can you imagine how cool it would have been for your Dad as a young teenager watching cars like a 1939 Packard driving down the street? It's just not the same today with 2015 Hondas, etc. I love barware and would love to have something like your bar when I have a house someday. It's really great.